If you want to build a social website like facebook or any other unique social platform then you can build your own social platform using WordPress. WordPress makes easy everything that related to web design and development. For creating a social network website you have to need to use a WordPress plugin that is called “BuddyPress”. BuddyPress is one of the most popular WordPress social media plugins that help you to build a complete social media platform like Facebook. If you want to create a social networking space for your friends or family then this is the best opportunity to start using your own website within very short time using WordPress social network themes. BuddyPress plugin is completely free. But there are some extra extension if you want to use one of them then it will cost some extra. Whether the free options is enough for a startup social network website. With BuddyPress plugin, you should use a BuddyPress compatible fully functional WordPress themes. Before choosing any theme you have to need to check the theme details and demo. And make sure every BuddyPress page template are available into the themes. It’s important for your visitor because a complete functional theme provides your visitor lots of useful user-friendly options that makes them very comfortable. There are lots of BuddyPress theme on the internet. So it’s pretty difficult to choose the best one following every requirement. In this post, I listed some of the best BuddyPress WordPress social network themes for you. And all sort of hand-picked theme from the different top-selling marketplace. I hope you like those list. 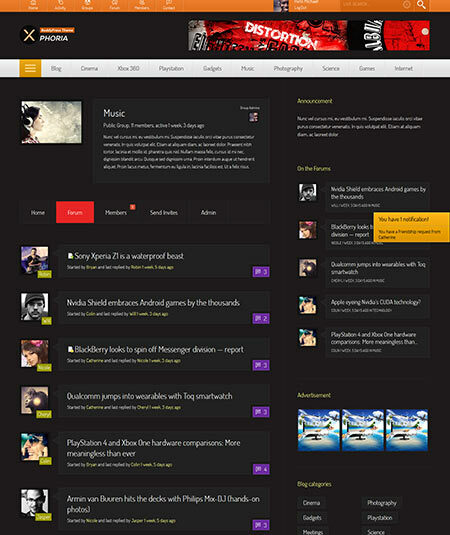 Some of the themes are specially built for the bbPress plugins. bbPress is one of the most popular WordPress social network plugins this is a forum plugin. You can add forum easily into your website using bbPress. 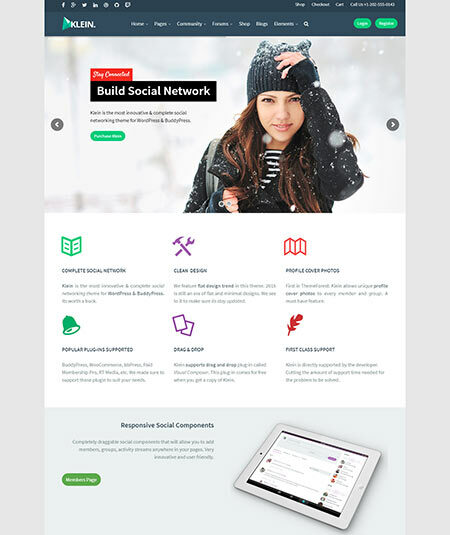 Aardvark is a fully functional multipurpose social networking WordPress theme. It’s overall design and layout is really first class. They mainly focus on the community website. 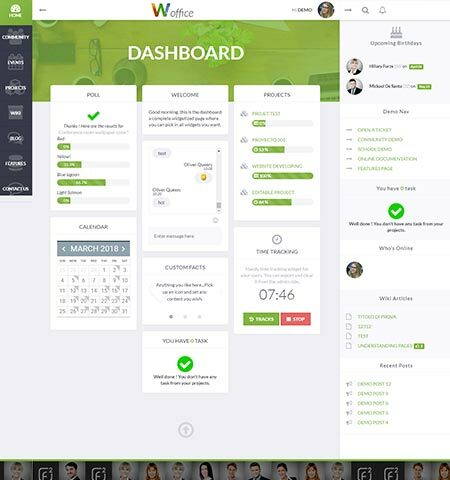 So you can create a social website, membership website, e-Learning website, eCommerce website, networking and blog website too using this Aardvark social network themes. Actually, it’s multipurpose theme. It has plenty of Social networking features that let you make your website fully functional. 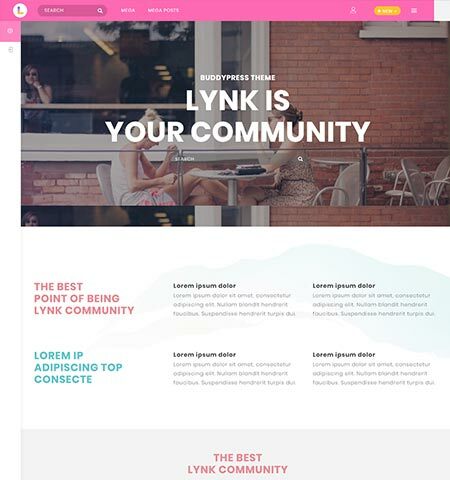 Lynk is a community BuddyPress WordPress social network themes. Lynk is specially built for BuddyPress plugin. This one is one of my favorite themes among them. Because it has pure high lighted BuddyPress social network design that makes it more awesome. It has some standard layout you can use this theme for your blog, newspaper and other social websites like you can create bbPress forum easily using this theme. 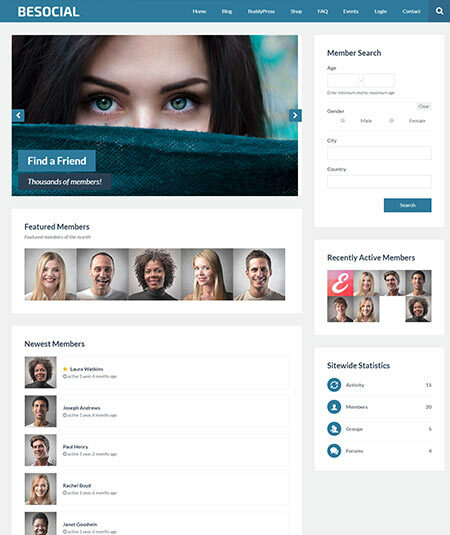 It’s a complete responsive modern WordPress social network themes. If you want to create any social website like Dribbble, Behance or any other social portfolio website where people upload their work and want to get attention to other experts on that category then this NRGNetwork WordPress social network theme is perfect for you. It has everything to ready to start a social networking portfolio website. It’s a complete social network theme. Interactions you can like other people project and also save your collection. 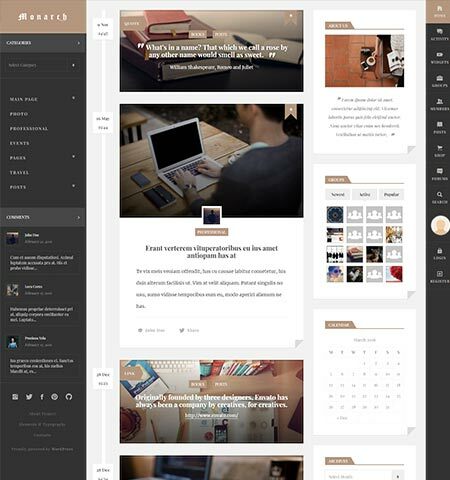 Monarch is a clean, professional, responsive, full-featured BuddyPress WordPress social network themes. It’s a next-generation WordPress theme. 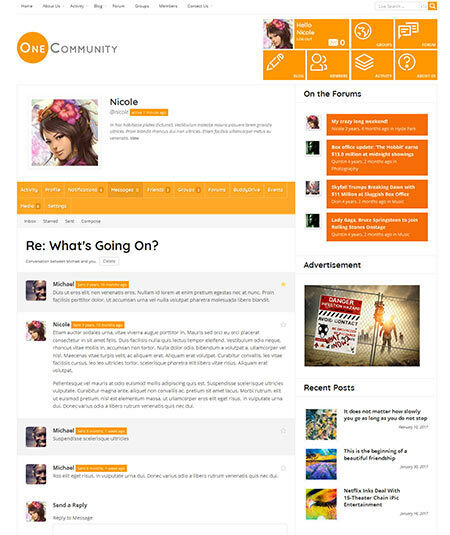 This theme is completely functional for creating an online community website. It’s easy to use. You can create social network website like facebook, twitter etc also education network system for school, team blogs, common interest etc. They follow the modern trendy design build their theme. PowerMag is a super fast muscular magazine and social network WordPress theme. It has ultra bold stylish typography. Using PowerMag you can create any type of niche website, viral website, blog website and also you can create an awesome social networking website within a few seconds. It’s easy to customize and very user-friendly backend. It has also retina ready graphics with 100% responsive layout. 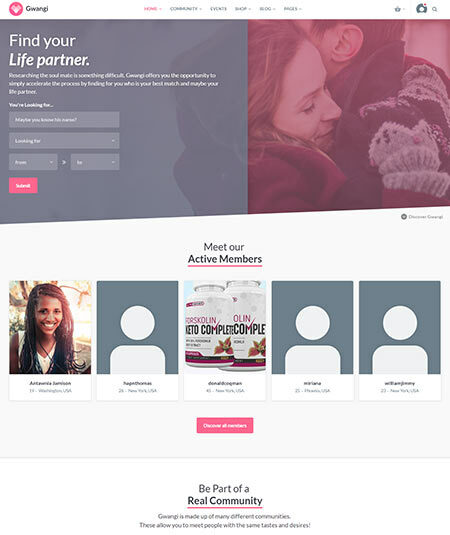 It’s a WordPress dating theme. You can call it WordPress social network themes also. Sweet Date has awesome design pattern with standard coding. 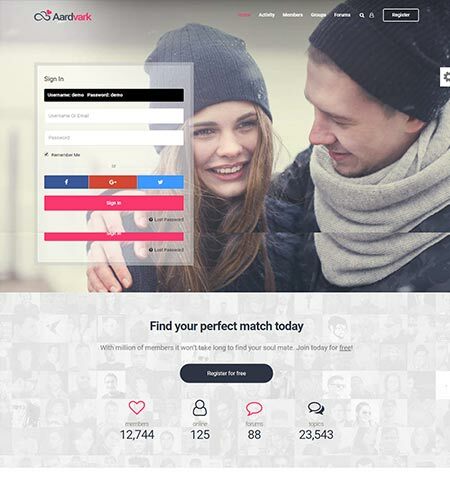 If you want to create any dating website within a very short time then Sweet Date is perfect for you to start right away. It has plenty of advanced features so it’s time to start right away don’t wait too long. 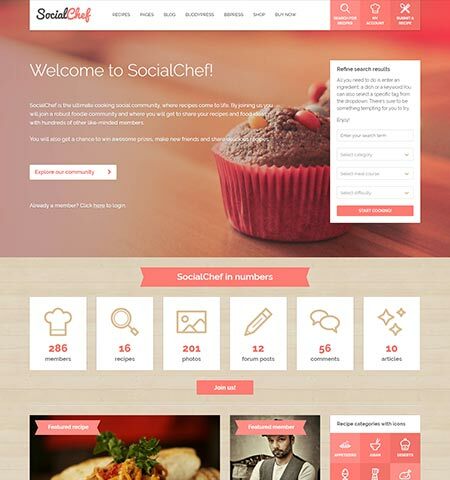 SocialChef is a social recipe WordPress theme. It’s a beautiful, clean standard responsive WordPress theme that comes with some advanced features. It has powerful advanced search options and front-end submission function. 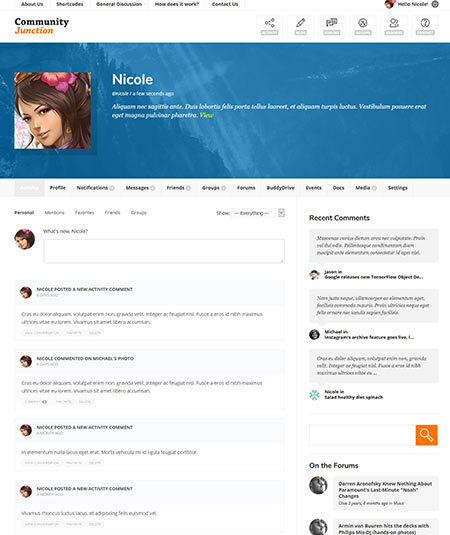 Using this theme you can create a social community like a forum, group, member profile etc. SocialChef is very easy to use for any person and manage groups, social network etc. Personally, I love this theme very much because it’s great professional looking design. A complete functional good looking theme. Woffice is no #1 Intranet/Extranet WordPress Theme. It has the rich powerful multipurpose advanced functions that give you an unlimited opportunity. Woffice follow the Google material design trends to build their theme. They use great UI elements on this template. It’s easy to navigate anywhere for its friendly user-interface. 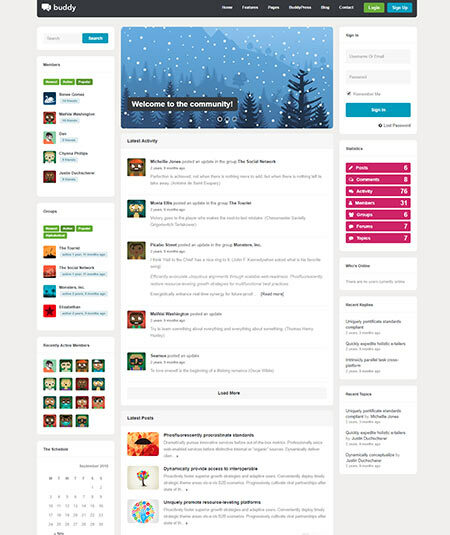 You can use this theme School Networks, intranets / Extranets or any kind of Community Network. 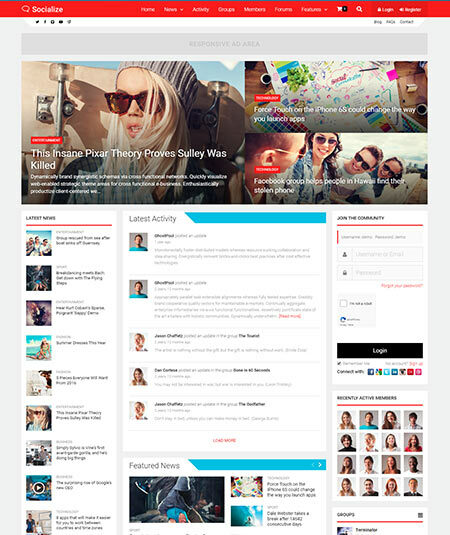 It’s an intranet & Community WordPress Theme. 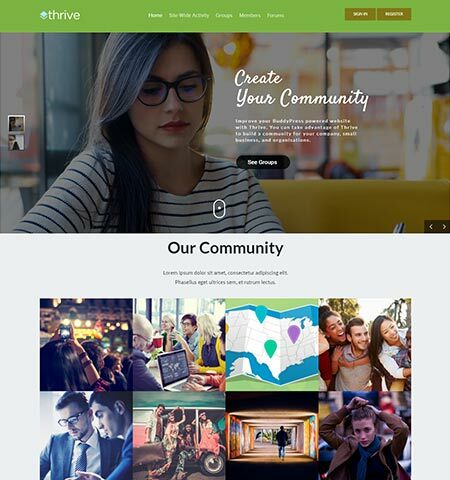 Thrive is fully responsive and retina ready community and intranet WordPress theme. Using this theme you can create any social networking website, messaging website, forum website, events and task manager website. Thrive has the unlimited foundation for this reason you can do whatever you want. You can change anything and add any new features on your website easily. 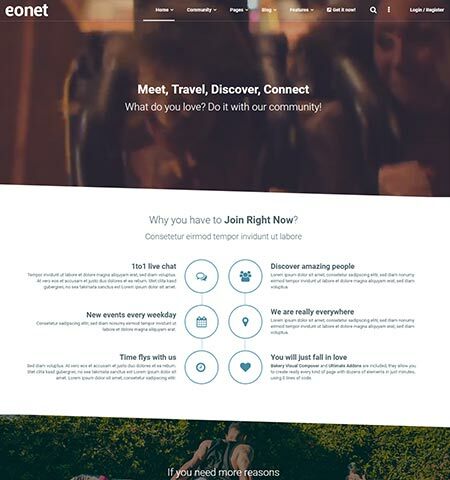 Gwangi comes with the huge features of its own and most compatible customization process for communities to build Buddy press website, Social new working website, Community forums, Community events, a Dating website and many more WordPress websites. This fascinating theme has the professional and impressive layouts to create stunning homepages, Beautiful headers, Standard blog pages, Unlimited footers, Unique navigation, Unlimited sidebars and many more that is the need in the website. 6 pre-built homepage layouts will be always ready to give you a very modern website within a few minutes. This modern theme is combined with Bootstrap 4, Amazing buddy press community features, Matchmaking, Unlimited membership listing, Mutual friend list and what not? For its awesome functionalities, this theme gains customer satisfaction with most 5 star ratings. This retina ready, mobile responsive and SEO friendly theme offers you unlimited premium and free plugins to make your website more professional to present your website in the world. Besocial is a remarkable theme to build an attractive social platform and community-focused website. This BuddyPress theme comes with all the extensive features that will make your website more professional to your clients. Besocial is a complete and prosperous community WordPress theme that is completely suitable for your Networking business. This vigorous and responsive theme comes with different blog and post formats layouts. You will find some advanced features with this theme like live search, live notifications, integrated with social sharing button and many more that you need for a networking website. This robust theme is integrated with woo-commerce so that you can also showcase your plans and subscriptions to your clients. This theme has the ability to display your members list similar to Facebook. This clean coded theme will provide you with some best plugins like The Events calendar, Mail-chimp, Site origin widget bundle, contact form 7. All in all Besocial theme offers you for the best user experience by RTL language. This alternative theme will help you to customize the social website easily. Your website will be rise high and will spread all over the world. 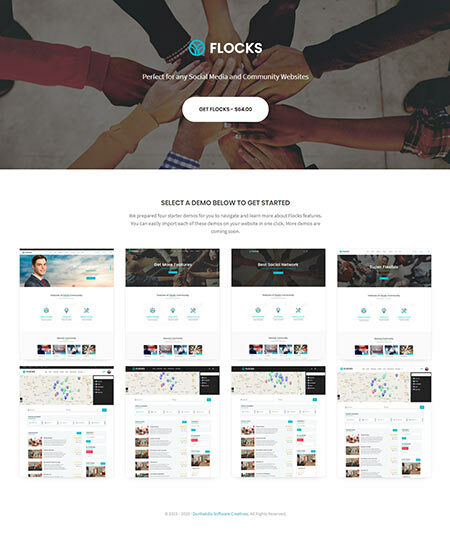 Flocks is a powerful intranet / extra-net WordPress theme which is perfectly suitable for social networking, business, school, community, government and any other organizations to create a modern, beautiful and unique website for them. This most flexible theme is fully editable by the live customizer to customize the website without any coding knowledge. This well-decorated theme is full of huge advanced features like buddy-press media with the latest version of woo-commerce, Geo directory, premium add-ons, unique header and footer layouts, personalized cover photos, one-click demo importer, mobile responsive and many more that will make your website more professional. There is also some powerful option, which can be used for enhancing the look and functionality of your networking website. Unlimited sidebar, unlimited message option, integrated with Google and Facebook, compatible with multi-language, custom registration and login page and many more functionalities you will discover by choosing this awesome theme. Don’t waste your precious time, try this latest and modern layout theme to build up a professional buddy press website. You will be guided by online docs and the developers of this theme will always ready to give you support. 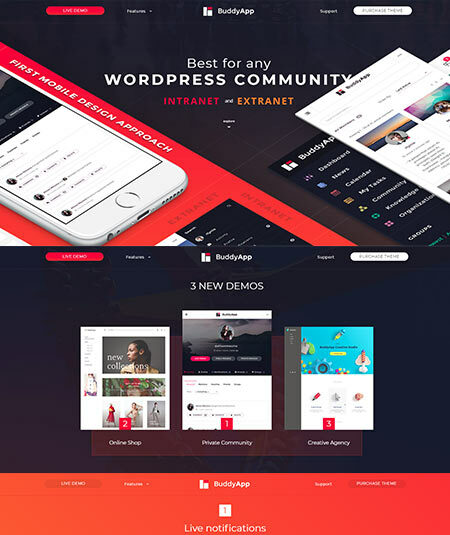 BuddyApp is a beautiful and high-quality template for WordPress private and public community and networking website as it is offering you a clean coded and appealing design and many useful and advanced features to represent a professional website around the world. Everything of this theme is well organized accordingly to keep mind about the unique buddy press apps features. The awesome features of this most beautiful theme will make your website most perfect. Features like live chat, live notification, file management system, rt media gallery, location management calendar, full-featured event registration and many more features can be applied to your website easily. This well-optimized theme will give you the best user experience in every browser and every mobile device. Special thanks to this themes builder that this template will provide you the flexible live customizer to set up the website more lively. 3 unique and beautiful homepage will be always ready in this theme to give you a nice and clean website within just a few clicks. Try this latest, retina ready and most outstanding buddy-press template to grow your networking website to people in the world. You will get FREE lifetime update by choosing this theme. Socialize is an exceptional WordPress theme that is integrated with Buddy-press and woo-commerce. This cultivated and well-organized theme is perfect for building an interactive community, forum, social networking websites. This fully functional theme is organized with huge features that will make your website stand out from the crowd of huge networking websites. You will be able to add sticky sidebar worth of $18 USD, can change the header from different header layouts, can add unique post formats, can add multiple advertisement areas, unlimited sidebars, font awesome library and a lot more advanced features with is SEO optimized template. You will get your desired social platform within just a few minutes to import homepage layouts from the unique layouts of this theme. Thanks to introducing with the Ajax filtering that allows you to an easy transition from one page to another page. You website load time will be greatly improved with this awesome feature. Also, you will offer different portfolio layouts, notification counter, log in pop up form and huge collections of cool features. Many thanks to the live customizer that will allow you to customize your website without coding knowledge. Grab this awesome template for your social platform to give a functional look to your website. One of the best and creative BuddyPress theme is Community-Junction theme comes with huge rare and best functionalities and quality best graphical appealing features which make this theme recognizable and confident among us. This user-friendly theme has plenty of option that you need to establish a Community website. This template offers you to use design blocks or shortcode from other WP-themes to create a layout. It has a powerful and easy to use page builder to design the pages. You can set a grid gallery for your members, forum, groups like public and internet as well as your clients will be able to create a group by themselves. The overall layouts and design of this theme are really awesome to fulfill all the requirements of any user. This superb template is also integrated with Rt-media so that you can keep your image public or private. You will get 40 inner pre-designed page to apply in your website. The top class features are like pop up member notifications, live global search, fully compatible with woo-commerce, and WPMU, huge custom shortcode and many more. Just explore this rich featured template for your website to make an outstanding online community in the internet world. One of the latest updates, most wanted and a new featured theme is KLEO is offering you for free lifetime update. With this theme, you can build community, material design, a travel website, E-learning website, the business also store for any kind of products. This template will provide you with exactly what you expect and want to build a community membership website. The feature ware mind blowing and very easy to use because of its live customizer. Now you have all freedom to use the best full-fled galleries, media, video, audio on your social website and make your website more detailed to your clients implementing charts, directory, connected with v and others demographics. You will get an amazing website within just a few clicks among the 30 unique pre-build homepage layouts by easy and peasy demo importer option. Save $110 USD by choosing this theme as this template includes Go pricing, Revolution slider, visual composer page builder and essential grid all are a premium plugin and you will get these free with this theme. You will also get one-page website functionalities. Don’t think twice to choose this awesome theme for your social networking website only because of its modern and clean coded features that will feel your best user experience. Let me introduce with another best social template Xphoria, which is integrated with the latest version of BuddyPress plugin and its rich functionalities. You can easily build a social networking website, school, sports, advertisement, plumber or any kind of community. However when it comes only for the social networking website then it comes with huge features and plenty of offers to draw the attention of your visitors. Your BuddyPress members will be able to see the mutual friends list and can connect with each other privately. Adding their own photos and bio is the another best function of this package. By the Amazing live popup notification, your members will be able to know new friend request, new message, chats etc. You can easily import high featured and configured 35+ pre-build inner pages within cool stylish login and registration page. This widget ready theme is also compatible with WPMU and Ajax search pro which is worth of $26 USD. This Buddy press theme also include unique white color scheme can be applied only one click. All in all, Xphoria has all kind of community-related features that you really want in your social community website. As well as it is a well-designed, highly customizable, modern and easily handling Buddypress template to build a professional, best and fully-functioning social networking online website. For creating a website based on social networking and community, you can choose Klein only for its advanced and very top class features. It is the building on Buddypress to interact with many users at once. Like the BBPRESS features, you will also get huge functionalities with this theme, like lifetime updates, easy customization panel, easy update notifications, huge color preset, 1000+ retina ready icons and huge collections of rich features. By this SEO optimized template, you will also make our products landing page because it is the woo-commerce ready theme. You can publish your website in many languages cause it is a translation ready theme. Klein will provide you the best premium and popular plugins to use in your website like Revolution slider, Paid membership pro, contact form 7. This magic theme will give you 40 + inner page to set up the forum, cool login and registration page for your customers. You will be able to choose a header preset from 6 different header design. Here is the option for unlimited sidebars to show your posts format. Your customer will also link their account with Google and Facebook. Don’t think too much to choose this theme for your networking website. You will be its happy customer because of its new features, quality performance and out of any bugs. 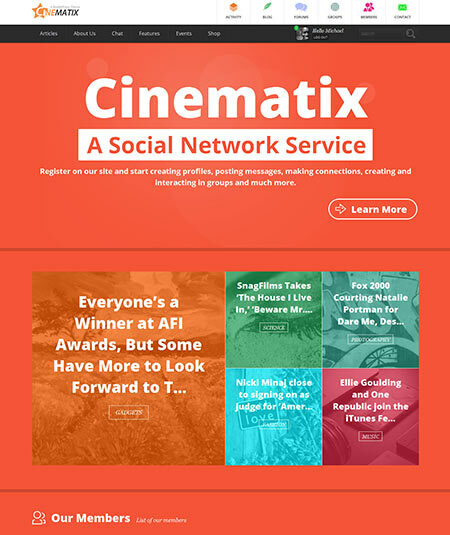 If you are looking for a fresh designed and modern template for your networking website then Cinematix will be your best choice. Not only community user can build entertainment and recreation website through this template. This latest template is working fine with the latest 3.0 version of BuddyPress. This amazing template comes with the modular design features with this function you will be able to use others themes short-code to design your dream website. Visual composer page builder and 1000+ short-codes from WordPress.org will help you in this regards. You can select your own custom color for your website skin because this template is predefined with color variations. $40+ pre-designed inner pages will allow your members to log in, registration, and build their clean profile, You can set up these all pages only because of the advanced features of BBpress. Your users will be able to send the private message with each other as well as they will be able to create private and public group in their prole ad Facebook. You can easily import its demo within just a few steps and customize the website from the back-end with a very handy live customizer. 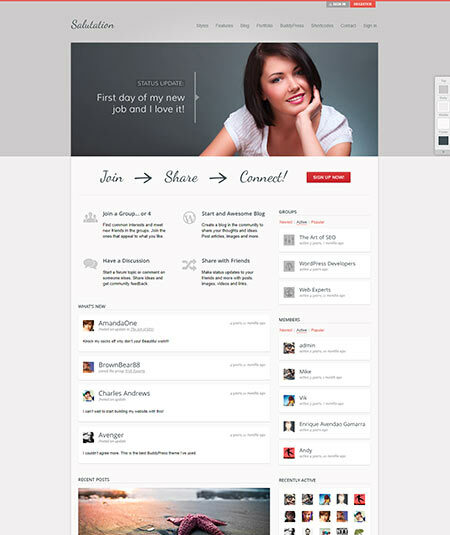 Try this flexible template to create a stunning social networking website for super user experience. 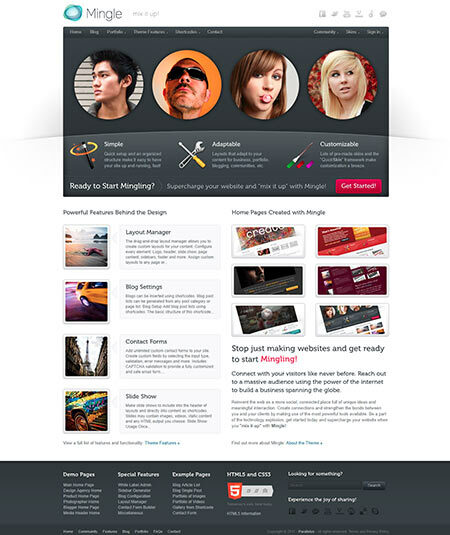 Mingle is a brilliant-premium BBpress theme that can help you to build the most fascinating community and increase your experience by promoting your website as a social networking website for people. This professional and modern designed template comes with huge collections of modern BuddyPress features. It is a high quality, latest updated, widget ready, a cross-browser compatible template to establish a fabulous networking website. The user will be able to add the custom layout for contents, pages, and posts with the latest and flexible layout manager. The user can easily change the header and footer layout as well. With this theme, you will be able to tell your story in a modern way to reach to the worldwide people. This well-documented theme offers you different kind of skins to give your website a new and different look than other community. You will easily handle the website customization by the theme option You will able to create unlimited sidebars by the sidebar generator. A log in pop up is also included in this beautiful theme. This theme also allows adding multiple page content. 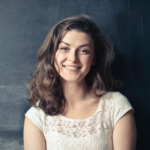 Your members will be able to add images, videos, audios, and their full bio. so, try this latest theme for your upcoming project. Salutation is one of the elegant, modern and minimalist themes for creating a networking website comes with the modern and quality best features that you need to make an awesome networking website. This fully responsive theme comes with all the latest features that let you display the pages and contents in a delighted way. This significant template design is really attractive that is gives you three kinds of skin options to set on your website. Unlimited blog layouts, page layouts, standard portfolio layouts and many more options are included with this tremendous template. You will able to customize your website easily with the admin panel. There is a very small work to start a social website on the internet only with just new clicks. Unlimited shortcodes will help you to build your desired layouts for the post, pages, and contents. The latest version of Buddy-press supports rt media to upload your customer’s pictures, videos and any kind of media file with an easy click. This awesome theme will also impress you with its cool pop up login form and the best registration page. This latest theme is free from any bugs because it is being updated its all features from time to time to ensure best and bug-free service to its clients. 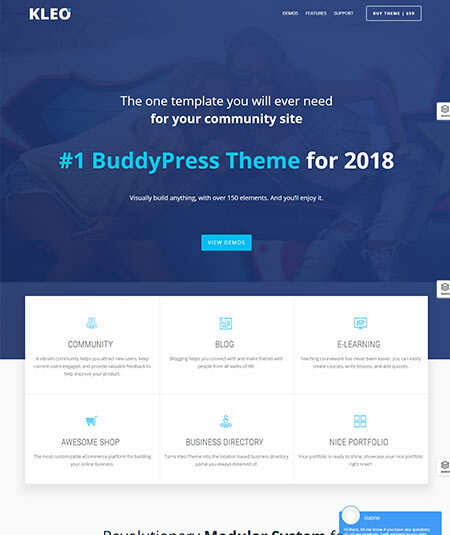 If you are looking for a popular BuddyPress integrated theme then Buddy will be your best choice. It is a lightweight and fully responsive theme for the community, social networking website, business, blog, corporate and any type of website. This retina ready theme includes valid HTML 5 and CSS 3 certificate and you will get the option to give your website a stylish look by huge collections of short-codes. 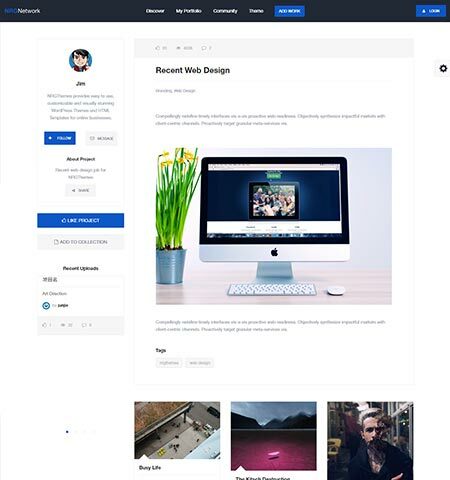 This clean coded theme also offers you to use font awesome for your contents, unlimited sidebars, individual and global options for each post and pages and many more features are waiting for you to choose this theme for your networking website. This SEO optimized template always has the feature for one click demo import so that you can get a rearranged website within just a few clicks. Members of your website will be able to create their own group and events and contact through private message with each other. Users also will be able to create a forum and can discuss for any kind of topics, all these features are only for bbpress integration. Try this translation ready template to create a multi-language website. The cross-browser compatibility and awesome customer support will give you the best user experience. An amazing and the most popular multi-purpose theme for social networking website is OneCommunity offers you the best BuddyPress features to make a professional online community. The overall design and layout of this beautiful theme is top class, This extreme theme offers you to use modular layout to design the blocks as your wish and you can import or export the theme’s short-code for another website also. You will also get 9 types of color scheme, create 3 types of blog layouts, create intranet and extra-net groups for members and guests on your website. This super fascinating theme also integrated with learn-press to create E-learning website. Lots of premium and free plugins are also integrated with this fantastic template. You will get Ajax search pro, Visual composer page builder, Revolution slider for free. You can also create a store in your networking website only because this theme is also integrated with woo-commerce. The latest version of bbpress will give you 40+ ready inner pages including login and registration page. The members of your website can upload images, videos, audios and any kind of media file in their profile as well as connect through a private message to each other. And for more features don’t waste your time to explore this theme.